Cassini’s Saturn: Incredible mosaic by Gordon Ugarkovic. 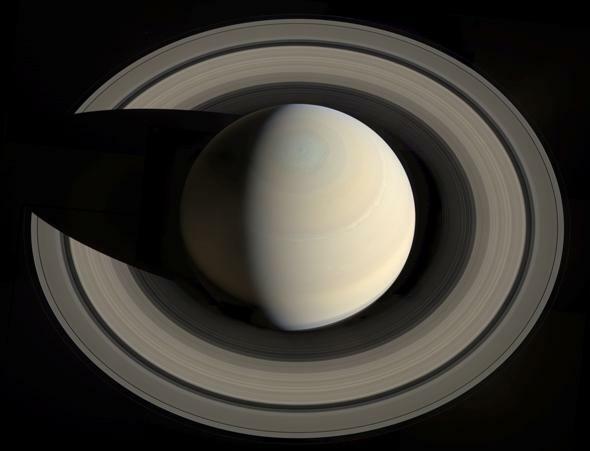 Saturn is so beautiful that it would be next to impossible to pick what would be my favorite picture of it ever. Impossible until now. Because HOLY HALEAKALA Croatian software developer and “amateur” astronomical image processor Gordan Ugarkovic has created a picture of Saturn so stunning words fail me. Look. I had to shrink the original 4000 x 3200 pixel behemoth to fit this blog. So please, click that picture to see it in full resolution. It’s staggering. On Oct. 10, 2013, Cassini took 36 shots of Saturn, a dozen each using red, green, and blue filters which approximate true color. Ugarkovic grabbed the raw files, processed them, and assembled them into this mosaic. The detail is incredible. Cassini was high above Saturn to the north, looking “down” on the ringed world when it took these images. You can see the bizarre hexagonal north polar vortex, the six-sided jet stream flowing around Saturn. The subtle but beautiful bands mark the cloud tops of Saturn’s atmosphere. Unless I’m mistaken, the thin white line you see wrapping around the planet at mid-latitude is the remnant of a vast storm so huge it completely dwarfed our own home world of Earth. And if you look carefully (you can measure it!) you can see that Saturn is highly flattened, its equatorial diameter wider than through the poles. But dominating this jaw-dropping scene are Saturn’s magnificent rings, seen here far more circular than usual. Cassini’s mission has been to observe Saturn and its moons, which means it tends to stay near the planet’s equator. But now scientists are playing with the orbit more, to do more interesting science. The spacecraft is swinging well out of the equatorial plane, so here we see the rings at a much steeper angle, and they are less affected by perspective. They jump out in this portrait. The broad, bright B ring in the middle; the outer, darker A ring; the fainter, inner C ring. You can see the dark gap called the Cassini Division (named for the astronomer after which the spacecraft itself is named), carved out by the gravity of the moon Mimas. The narrower groove near the edge of the outer A ring is the Encke Gap, created by the tiny moon Pan — that gap may look narrow, but it’s 325 km across, roughly the distance from Washington, D. C. to New York City. Just outside the main rings you can catch a glimpse of the narrow F ring (you have to look at the high-res image and zoom in to see it). At about the two o’clock position is, I believe, the moon Prometheus, and at about one o’clock is Pandora. They orbit just inside and outside (respectively) the F ring, acting as “shepherd moons”, whose gravity keeps the ring confined to such a narrow band. Also, note how you can faintly see the dark side of Saturn, to the left. The clouds on that side of the planet are not being lit by the Sun, but by the reflected light from the rings themselves! In the same way our own Moon can be bright enough to read by, Saturn’s rings illuminate its night. Imagine: Saturn, by ringshine. And, of course, the shadow of the mighty planet falls across the rings, blacking them out. This image reminds me strongly of another favorite Saturn shot, taken by Voyager 1 in 1980. But Cassini’s advances in technology, coupled with Ugarkovic’s master touch, have easily replaced it. There is just something about Saturn. It profoundly affects all of us when we see it, and was the first object I ever saw through a telescope when I was a lad. It is no exaggeration to say I am an astronomer today because of that first glimpse. And after all these years, it never, ever gets old. A profoundly deep tip o’ the lens cap to Emily Lakdawalla at The Planetary Society blog for tweeting about this picture. If you’re on Twitter, follow her.